Powers/Abilities: Mana could form magical shields, project mystic bolts, and cast a variety of spells (including freezing other objects and beings). She can mystically bless objects and beings, granting them a Shosei purification aura that allows them to better combat dark mystical threats. She was aware of anything that happened or was said around the Mark of Mana. She also wielded an unidentified blade and dagger, with which she was proficient in combat. She was also the holder of the Blade of Blood. 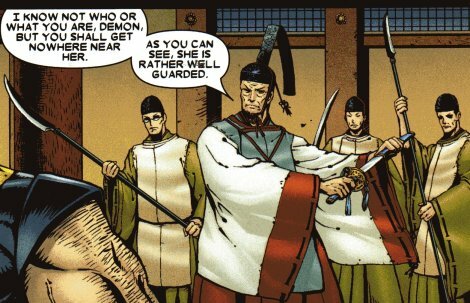 (Wolverine: Soultaker#3 (fb) - BTS) - The members of the Shosei Order were mystic guardians of Japan. Mana's family protected Japan's shores for over 800 years. A lineage of Miko priestesses safeguarded Japan from demons, curses, and magical threats over the centuries. (Wolverine: Soultaker#3 (fb)) - A Miko priestess and a pair of warriors battled a giant, red, magical creature. (Wolverine: Soultaker#3 (fb)) - A Miko priestess, alongside a white tiger, battled a giant blue demon from Hell. (Wolverine: Soultaker#3 (fb)) - As one priestess fell, another would take her place and serve her order as its champion. 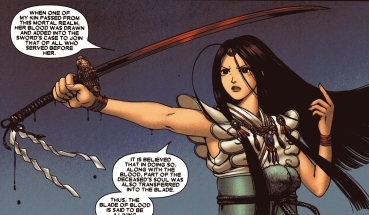 (Wolverine: Soultaker#4 (fb) - BTS) - As each priestess died, her blood was drawn and added to a case that held the Blade of Blood, the Shosei Order's ceremonial weapon, to join that of all who had served before her. It was believed that by doing so, along with the blood, part of the deceased's soul was transferred into the Blade, making it a powerful weapon. The Blade would only respond to the current head priestess of the Shosei Order; for someone else to use it, the priestess had to willingly give it over to them, commanding the souls to respond to the hand of another. (Wolverine: Soultaker#3 (fb)) - Mana and her twin sister Hana were born to the Miko priestess lineage, destined to clash over leadership of the Order. This meant little as they were children, but as they grew older they became bitter rivals, each trying to prove themselves the more capable warrior. (Wolverine: Soultaker#3 (fb)) - When it came time to decide who would inherit the mantle of leadership, Mana emerged victorious. (Wolverine: Soultaker#3 (fb)) - Mana became high priestess of the Shosei Order, while Hana turned her back on the Order and departed. (Wolverine: Soultaker#3 (fb)) <1864 AD> - Hana eventually returned and sought to assume control of the Order via powers she'd gained through studying the dark and forbidden mystic arts. 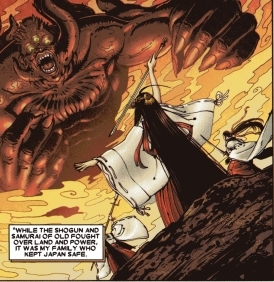 As Mana and Hana battled, Hana loosed the ancient demon Ryuki, a demon from Ashurado, the fourth level of Hell with the power to control the dead. Ryuki possessed Hana's body and sought to have his undead minions slay innocent victims whose souls Ryuki would absorb, increasing his own power. Once sufficiently powerful, Ryuki would be able to open a gateway at the Bridge of Six Realms and crossover from Hell into Earth in his own body. (Wolverine: Soultaker#3 (fb) - BTS) - Ryuki started his mission by taking Hana to Mibu-Zuka and reanimating the Shisengumi, eleven of the most deadly samurai to ever live; they had been executed as traitors when the shogunate fell. (Wolverine: Soultaker#3 (fb)) - With no time to come up with a more permanent solution, Mana trapped Ryuki's soul within her (Mana's necklace), but was forced to also trap both Hana's and her own soul within the necklace as well. (Wolverine: Soultaker#3 (fb) - BTS) - The Shosei Order protected Mana and Hana's bodies and the necklace, the Mark of Mana, in hopes of finding a way to save their imprisoned souls. Decades passed as no spell could be found that would release the sisters without freeing Ryuki. (Wolverine: Soultaker#3 (fb) - BTS) - One night, an Ashurado cult that had long worshipped Ryuki stormed the Shosei shrine and stole Hana's body and the Mark of Mana. However, without Mana's body they could not perform the spell to release Ryuki. For years the Shosei Order kept Mana's body hidden while the Followers of Ashurado searched for it. (Wolverine: Soultaker#1 (fb) - BTS) - The thief Yukio stole the Mark of Mana necklace from the temple the Followers of Ashurado, after which she began to hear a female voice, muttering about twin sisters, ancient evil, and the end of the world. (Wolverine: Soultaker#1 - BTS) - Yukio met with her friend Wolverine, who was visiting Tokyo to see his adopted daughter, Amiko Kobayashi. She told him of the Mark of Mana, and Logan took her to see Kenichiro, a friend of his versed in Japanese mysticism. Kenichiro was distressed to see what they had brought into his house, telling them that there was an evil spirit trapped within it and that she would haunt all who contacted it. Kenichiro gathered some charms and told him to take them for protection and leave, coming back in 2 days after Kenichiro had prepared the proper mystic wards. Instead, they were attacked by a group of warrior monks, the Followers of Ashurado; Kenichiro was slain, but Wolverine and Yukio polished off their attackers and departed with the Mark of Mana, which granted Logan visions of Hana & Mana. It told him where to go to start looking for answers. (Wolverine: Soultaker#2) - Logan followed the Mark's guidance to travel to Kyoto where he located and infiltrated a temple holding Mana's body. He confronted the Servants of Shosei and learned they were her protectors before they were all attacked by more of the Followers of Ashurado. The Servants of Shosei fell before the powerful Ashurado followers, but not before their leader told Logan to take Mana and her blade and flee, and he fought his way out. He took Mana's inert body to a distant house and placed the Mark of Mana on her, hoping that this would allow Mana to tell him what to do. 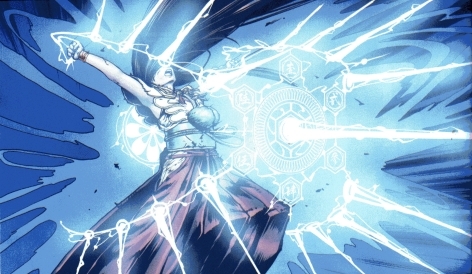 Contact with the Mark indeed awakened Mana, restoring her soul to her body, but it also released Hana's spirit. (Wolverine: Soultaker#3) - Mana cursed Logan for dooming the planet and blasted him mystically, but when he fought back, she smelled the Ashurado blood on his claws and recognized that he was not her enemy. She explained her origins and the release of Hana and Ryuki, noting that the series of events that led Logan to her were too random to have been premeditated, though the hands of the spirits that watch over these lands may have guided his path. Mana then sent Logan to Mibu-Zuka as she suspected Ryuki would start with the Shisengumi again, first blessing and purifying his whole body and giving him a set of gloves. As he left, she set out to seek advice on how to gain a more permanent solution. (Wolverine: Soultaker#4 (fb) - BTS) - Mana rediscovered the texts that spoke of the god Oinari's connection to their clan. (Wolverine: Soultaker#4) - While Logan confronted Hana/Ryuki and destroyed the Shisengumi, Mana traveled to the Toji temple in Kyoto where she magically opened a secret portal into a lower room. She then approached a statue of Oinari and mystically summoned him, telling him that the Shosei Order has fallen into ruin and much of their mystic knowledge lost. Aware of the fate of the Order and the release of Hana and Ryuki, Oinari told her that Ryuki's weakness was to gold (similar to how many spirits had weakness to silver or iron). He then departed, telling her that they would meet again and on that day she would return this favor; Oinari also passed his blessings on to Logan. After Logan had destroyed the Shisengumi, Hana/Ryuki told him that Mana could end their struggle by delivering to them the Blade of Blood at the Bridge of Six Realms at sunset tomorrow; and if Mana failed to do so, Ryuki/Hana would bring Hell to Earth. Mana arrived soon after Hana/Ryuki departed, having correctly assumed Hana/Ryuki would want the Blade of Blood and brought it with her; she knew that Ryuki wished to use the power of the Blade's souls to open a gateway to Ashurado. She gave Logan the Blade, telling him he would wield it against Hana/Ryuki at the proposed meeting place, as this would be their chance to put an end to Hana's madness once and for all and to send Ryuki's spirit back to Ashurado. (Wolverine: Soultaker#4 - BTS / Wolverine: Soultaker#5 (fb) - BTS) - Mana led Logan to acquire some gold, which they used to coat the claws on his right hand. (Wolverine: Soultaker#5 (fb) - BTS) - Ryuki's agents ambushed and captured Yukio and Amiko. (Wolverine: Soultaker#4) - The next day, Mana and Logan (wielding the Blade of Blood), met Hana/Ryuki and Ryuki's demon legions at the Bridge of Six Realms at sunset. 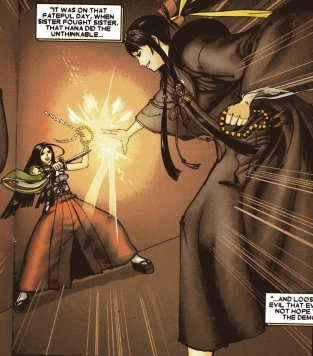 (Wolverine: Soultaker#5) - Hana/Ryuki demanded Mana hand over the Blade of Blood, but Mana refused, denouncing Hana as no longer being her sister and telling Ryuki they would use the Blade to destroy him. Using her blade and her mystic spells, Mana aided Logan in slaughtering Ryuki's demon-monsters. Ryuki/Hana then summoned a number of harpy-creatures carrying Yukio and Amiko and demanding Logan surrender the Blade to save their lives. Despite Mana's protests, Logan gave the Blade to Ryuki/Hana who then used it to knock Logan away. As the demon prepared to add Yukio and Amiko to his soul harvest, Mana opposed him, using her smaller blade to counter the Blade of Blood. As they battled, Mana apologized, noting that she had been left no choice, and then Logan impaled and then slashed Ryuki with his gold-coated claws. Collapsing but refusing to accept defeat, Hana crawled toward her weapon, but Mana held Logan back, demanding the honor of ending her sister's life. Hana begged to be trapped back within the Mark of Mana, but Mana told her that it was too late for mercy and that her fate belonged with her demon lover, Ryuki, in Hell. She plunged her dagger into Hana's chest, killing her. With Hana's death, Ryuki and his demons were cast back to Ashurado. Amiko picked up the Blade of Blood and heard whispering, which confirmed that she was a direct descendent of the Shosei Order. Mana resolved to train Amiko as her successor, and Amiko agreed, hoping to one day become the best there was at what she does. Comments: Created by Akira Yoshida and Shin "Jason" Nagasawa. As each priestess died, her blood was drawn and added to a case that held the Blade of Blood, the Shosei Order's ceremonial weapon, to join that of all who had served before her. It was believed that by doing so, along with the blood, part of the deceased's soul was transferred into the Blade, making it a powerful weapon. Ryuki sought it to claim the power of its souls to open a portal to Ashurado, but Mana gave it to Logan who wielded it against Ryuki. When Ryuki threatened Amiko and Yukio, Logan handed it over to Ryuki and Mana fought him to give Logan time to get Amiko and Yukio to safety, after which he used his gold-coated claws to dispatch Ryuki. Mana's necklace. She trapped Ryuki's spirit within it back in 1864, but was forced to trap her own and Hana's spirits within it as well. The Shosei Order protected Mana and Hana's bodies and the necklace, the Mark of Mana, in hopes of finding a way to save their imprisoned souls. Decades passed as no spell could be found that would release the sisters without freeing Ryuki. (Wolverine: Soultaker#1 - BTS) - Yukio and Wolverine took the Mark of Mana to see Kenichiro, a friend of his versed in Japanese mysticism. Kenichiro was distressed to see what they had brought into his house, telling them that there was an evil spirit trapped within it and that she would haunt all who contacted it. Kenichiro gathered some charms and told him to take them for protection and leave, coming back in 2 days after Kenichiro had prepared the proper mystic wards. Instead, they were attacked by a group of warrior monks, the Followers of Ashurado; Kenichiro was slain, but Wolverine and Yukio polished off their attackers and departed with the Mark of Mana, which granted Logan visions of Hana & Mana. It told him where to go to start looking for answers. 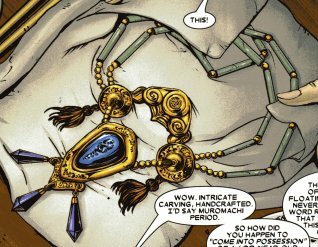 (Wolverine: Soultaker#3-5) - Mana reclaimed her necklace. (Wolverine: Soultaker#5 (fb) - BTS) - Amiko Kobayashi's mother was apparently a member of the Shosei Order who left for reasons of her own to have a family and a normal life. (Uncanny X-Men#181) - Amiko's mother was slain, and she gave her daughter to Wolverine to raise. 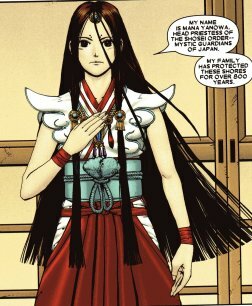 (Wolverine: Soultaker#5) - Amiko picked up the Blade of Blood and heard whispering, which confirmed that she was a direct descendent of the Shosei Order. Mana resolved to train Amiko as her successor, and Amiko agreed, hoping to one day become the best there was at what she does.